JAKARTA, Indonesia — Hammering a podium and railing against the rich and powerful, Prabowo Subianto, a former general now in the homestretch of Indonesia’s presidential campaign, whipped up the crowd of thousands.“I am sick and disgusted with the evil elites in Jakarta!” he bellowed, referring to the Indonesian capital as he harangued his troops like the general he once was. “Disgusted! Always lie, lie, lie. Lie to the people!”A microphone went flying as he hit the podium with his open hand. The crowd, at a rally last week in Yogyakarta, about 250 miles southwest of the capital, roared its approval, and he struck it again. His supporters chanted, “Prabowo! 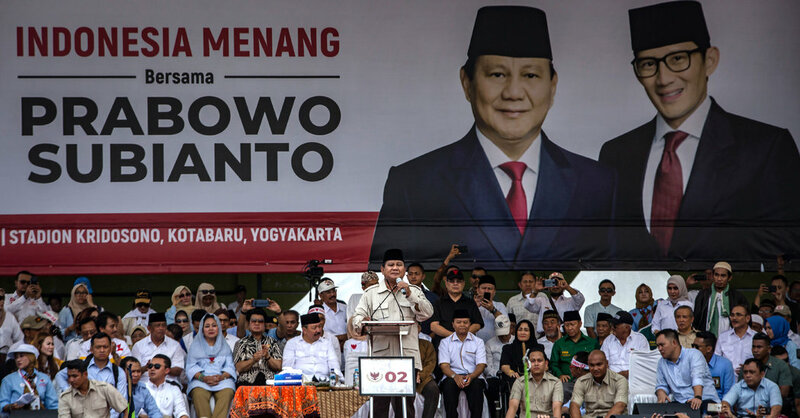 Prabowo!”The message was a strange one, coming from the scion of one of Indonesia’s most powerful and politically connected families. But making his fourth and perhaps final try for the presidency, and trailing in the polls by double digits, Mr. Prabowo, 67, is pulling out all the stops.The son of a Christian mother and the son-in-law of the former dictator Suharto, Mr. Prabowo has transformed himself this election cycle into a crusading populist and devout Muslim in a last-ditch effort to woo nationalists, hard-line Islamists and the large number of poor Indonesians who struggle to make a living. ImageA rally for Mr. Prabowo in Jakarta, the Indonesian capital, this month. He was once a prime example of the elites he now attacks.CreditWilly Kurniawan/ReutersWinning the presidency would be a personal triumph for Mr. Prabowo and complete the remaking of his image. Mr. Prabowo has run for president in every national election since Mr.